M-protein is an antibody—or part of an antibody—that can show up in tests of your blood and/or urine, and its presence can mean different things. In blood cancers such as myeloma, the 'M' in 'M protein' stands for monoclonal. A monoclonal protein is produced by the abnormal, cancerous or precancerous cells. It’s called a monoclonal protein because there is a single clone, a mono-clone of “identical-twin cancer cells,” all making this protein. The M protein is like a defective product, mass-produced; it does not fight infection and has no real use. In the image, the Y-shaped blue antibody, or immunoglobulin, is the M protein. The big round object behind it is a plasma cell, which makes the antibodies. Not all M proteins are whole antibodies like the one shown. Sometimes, the myeloma's M protein is only one piece of an antibody. In the context of myeloma, M protein refers to the abnormal production of your body's antibody-producing plasma cells. Unfortunately, "M protein" may be laden with different meanings in medicine, depending on the topic or illness that is being discussed. M protein may stand for viral matrix protein as in the M1 protein of the influenza virus. M protein may be used in referring to a specific bacterium, streptococcus pyogenes. M protein, or actually "protein M," is relevant to the bacterium mycoplasma genitalia. Whole antibody proteins are called immunoglobulins. The M protein is an immunoglobulin—or part of an immunoglobulin—that is described as monoclonal, meaning it is produced by a single clone of problematic cells. It is not normal for the body to have so many copies of the exact same protein as generally occurs in myeloma, and this excess is detectable in laboratory studies. It can also cause problems in the body, especially if levels get too high. In multiple myeloma, the M protein comes from a great excess of plasma cells. Ordinarily, plasma cells will produce a wide range of antibodies. In the normal or healthy state, the population of plasma cells capable of producing a wide array of different antibodies—so-called polyclonal antibodies, or polyclonal immunoglobulins. When plasma cells become cancerous, often there is a single, very bad cell that has given rise to many identical minions. All of the minions are clones of the same cell, and they make only the same monoclonal proteins. Since there are a lot of plasma cells, multiplying abnormally, they make a lot of this monoclonal protein. The abundance, or spike, in the volume of just one protein, can be detected in lab tests. 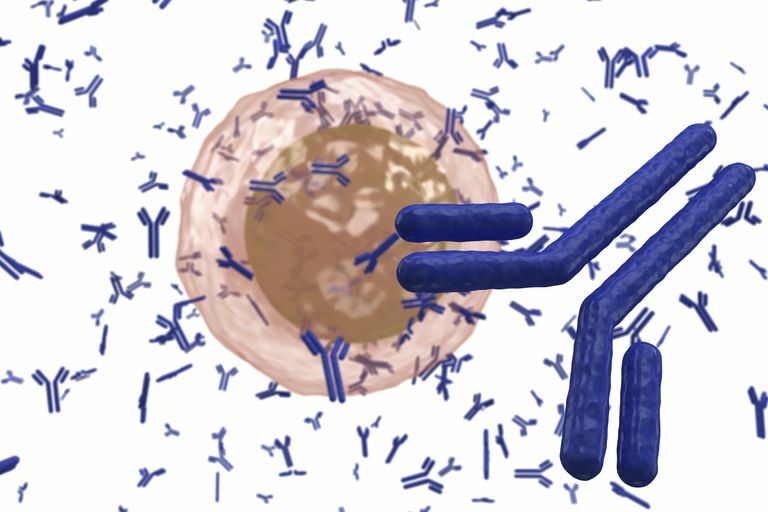 Each antibody is made up of four parts. There are two long chains on the inside, and two shorter chains on the outside. In the image, you can see a plasma cell with an antibody and many other tiny antibodies in the background. The light chains, or the shorter, outside lines in the "blue Y" in the picture, are also called a Bence Jones proteins, or free immunoglobulin light chains. In this case, it is just a small piece of the huge antibody. When the M protein is a light chain, it is small enough, in fact, that it may pass through the kidneys and enter into the urine. So, if only a blood test is done the light chains can be missed since they have entered the urine. On the other hand, if the M protein is a whole immunoglobulin—the whole big Y in the picture—then it can be detected in the blood since it is too large to pass to the urine. And because these large proteins are retained, excessive buildup of such M protein in the kidney may cause kidney disease. Kidney damage: When M proteins are big enough and plentiful enough in the case of malignancy to clog the functional units of the kidney, this can lead to kidney disease and ultimately kidney failure. Depending on the characteristics of the secreted protein, other harmful effects are possible. Myeloma - A urine test will be positive for M protein in 50 to 80% of people with myeloma. MGUS - Monoclonal gammopathy of undetermined significance may have an elevated level. Waldenstrom's macroglobulinemia - This cancer, which involves cells which are precursors of plasma cells, may have an elevated M protein level. In some cases, cells causing the M-protein are malignant, and they may invade the bone, lymph nodes, liver, spleen, or other organs. This is the case in multiple myeloma, solitary plasmacytoma, and Waldenström macroglobulinemia. In other cases, the M-protein is produced by a small, limited, pre-malignant clone of cells that has expanded, and this causes no symptoms. This is the case in monoclonal gammopathy of undetermined significance MGUS. Many conditions can cause a monoclonal gammopathy, a spike in one protein product; and, not all of these conditions are cancerous. You can have M protein with certain connective tissue disorders, like systemic lupus erythematosus, rheumatoid arthritis, and psoriatic arthritis. You can have it with Hepatitis C virus infection and HIV/AIDS. You can even have it with acquired von Willebrand disease, a rare bleeding disorder. Thus, in many instances, the cause of the M protein is more important than the mere presence of this finding. Papanikolaou X, Rosenthal A, Dhodapkar M, et al. Flow cytometry defined cytoplasmic immunoglobulin index is a major prognostic factor for progression of asymptomatic monoclonal gammopathies to multiple myeloma (subset analysis of SWOG S0120). Blood Cancer Journal. 2016;6(3):e410-.